My Green Thumb, or Not? I wish I could say that my ever-greener thumb is responsible for the baskets overflowing with tomatoes and ripe red peppers in the kitchen, and strings of fat, sweet onions hanging from garage rafters. Ripe figs hang lax from branches, a drop of honeydew in each of their “eyes” telling me they want picking. The season has been bountiful. I can’t recall anything special that I did this season that would have boosted the harvest of so many different fruits and vegetables. The soil, as usual, got lathered with an inch deep layer of compost. Transplants and seeds got started with hand watering, then drip irrigation automatically quenched plants’ thirst from then on. I kept my usual eye out for insect or disease pests. Sweet Italia peppers, like everything else, bore in abundance this season. Into the ground goes the stinking rose. That’s garlic. As a matter of fact, by the time you read this my garlic cloves will have been in the ground for awhile, since the beginning of the month, already sending roots out into the soft earth. Planting garlic this early is sacrilege in most garlic circles. But it may make sense. 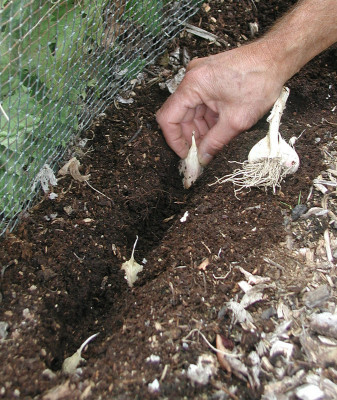 Garlic needs a period of cool weather, with temperatures in the 40s, to develop heads. Without that cool period, a planted clove merely grows larger, without multiplying. Which is why it’s planted in fall. Spring-planted garlic might still get sufficiently chilled or needs to be artificially chilled, but yields are generally are lower than fall-planted garlic. It’s time to get the hormones pumping. No, not by me embarking on some testosterone-fueled, garden-related feat of strength or endurance. 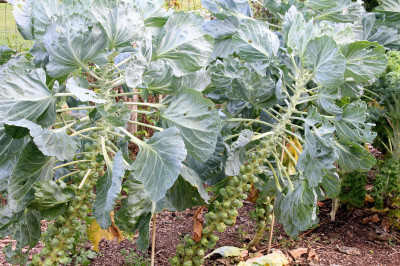 Not even my own hormones, but the ones in my plants, more specifically my brussels sprouts plants. And actually, quashing the action of one hormone so that other hormones can come to the fore. There’s a flurry of seed sowing and setting out of transplants going on here. Am I deluded that it’s springtime? No. Autumn is around the corner and there are vegetables to be planted. For many gardeners, summer’s end and the garden’s end are one and the same. 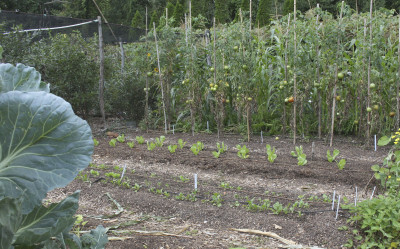 But planning for and planting an autumn vegetable garden bypasses the funereal look of waning tomatoes, peppers, cucumbers, and other vegetables that thrive only with summer heat and long days of sunshine, and puts plenty of fresh vegetables on the table. Having an autumn vegetable garden is like having a whole new garden, one that gradually fades in, like a developing photograph, as summer vegetables fade out.